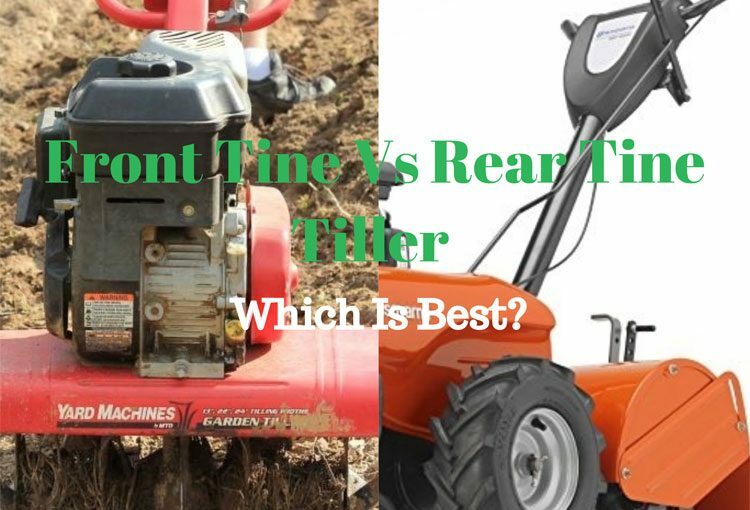 Front Tine Vs Rear Tine Tiller- Which Is Best? →Front Tine Vs Rear Tine Tiller- Which Is Best? Cultivating your garden manually is labor intensive and will take longer than if you had used a garden tiller. Whether you are planning to cultivate your flower garden, reseed your farm or cultivate massive lawn year after year, investing on a tiller will help get the job done faster and effectively. These fantastic tools are a great investment for any homeowner or professional landscaper who may be looking forward to professional results. However, as much as these machines are known for their great performance, you ought to know exactly which one matches your field and needs. Normally, tillers are of two types and each of these types has distinct features which set them apart from each other. But before we go the fun part, you need to know them better. A tiller is a cultivating tool which is usually used by homeowners or professional landscapers to till so they can prepare new flower gardens, reseed, or plant new flowers. The tiller usually has blades which are popularly called tines which are perfectly housed in a housing unit which is connected to the wheels. As the name suggests, front tine tillers have tines which generate force in a forward direction. Normally, the tines are located in front of the engine to allow for adequate weight to be pulled towards the tines allowing the machine to maneuver easily on contours and steep terrain. The wheels are not engine operated and will require the operator to stand on the back and hold the device. Maintenance of a constant grip is required to navigate and easily maneuver around. 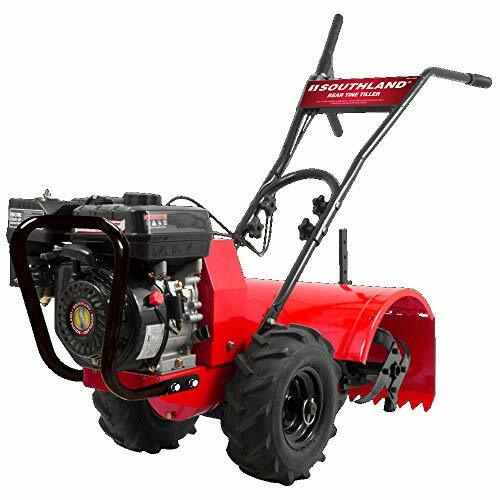 Front tine tillers are handy and provide great maneuverability even in the tightest corners. They are inexpensive and lightweight. 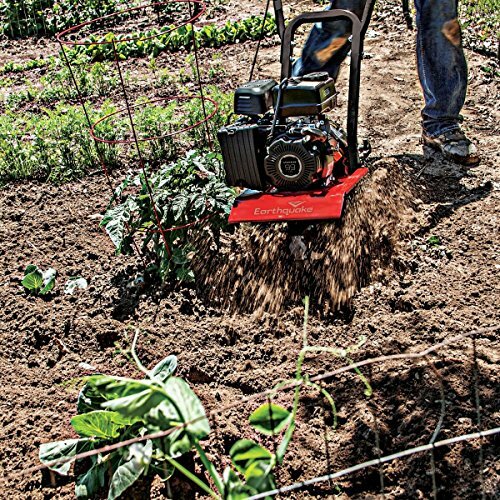 For greater efficiency, the Front tine tiller will require leverage and more power to guide the tiller which makes them ideal for small to medium sized gardens. Though they are efficient on small sized gardens, they are not recommended for use on virgin land. Rear Tine tillers are powerful machines which are used by professional landscapers and homeowners to till large tracts of land. They are powerful which makes loosening compact and hardest soils easy. Unlike their counterparts, they loosen soil effortlessly without calling for massive labor which makes them ideal for tilling virgin land. As the name suggests, forward tine tillers have tines which rotate the same directions as the wheels. They are recommended to use in a garden with a depth of 5-inches or less. Counter tine tillers have tines positioned on the rear while the engine is at the front part. Unlike their counterparts which only rotate the tines on a forward direction, rear Tine tillers rotate the tines backward as its wheels drive in a counter-rotation motion. They are more powerful as compared to the forward tine tiller models which make them a great pick for loosening compact soils like clay faster and effortlessly. Dual tine tillers have tines which rotate in both directions. They have strong and rugged tines which penetrate easily through any soil giving exceptional results faster. Compared to the other categories, they are more powerful and quiet. However, owning one comes with a cost but it is worthwhile. Which is the best Tiller? Though both front and rear Tine tillers are designed to help till land easily, they differ greatly on their design, features, and the way they function. And before you could jump in to rent or make a purchase, you ought to be sure the type which will work for you. For instance, if you are a beginner who is not well experience and looking for a tiller which is handy and affordable then a Front Tine Tiller could be a great pick for you. They are easy to maneuver and ideal for stirring up light soils or tilling already established beds. Compared to Rear Tine models, front tile tillers are less powerful and have smaller tires which do not deliver enough power to till compact soils. In regards to size, front tillers are smaller and require small storage space compared to their counterparts. They are easy to operate and due to their size, they can only handle up to 5,000 sq. ft while a Rear Tine model can break tough soils and new grounds of up to 10,000 sq. ft. Though front tine models allow you to till on the hard to reach corners, a Rear Tine tiller will give you more versatility and great maneuverability. This is because rear Tine tillers have heavy duty tires and strong tines which generate better traction to get the job done. All you need is to hold the tiller and guide on where to cultivate. Unlike front tine models, rear tillers loosen the soils in both forward and reverse motion. This great feature allows you to easily back up and re-till those areas you may have missed, giving you a consistent and professionally tilled land. This makes them stand out from their counterparts. It is beyond any reasonable doubt that Rear Tine Tillers can be a great addition to your tool arsenal. They are designed to deliver great power required to cultivate your garden even for the most demanding projects. From tilling virgin land to loosening compact soils, to mixing tilled soil with manure, these devices will give you versatility like no other. Though they are expensive, owning one is a great investment to any homeowner or landscaper.